After spending a pretty boring week in Dallas, we knew that nothing could snap us out of our rut more than a lake view would. 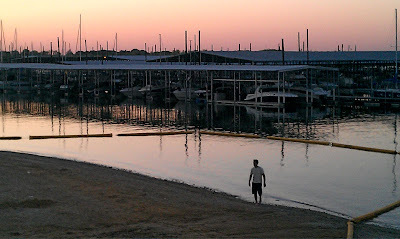 We headed up to Denton for a few nights and went out to Sneaky Pete's on Lewisville Lake. Numerous indoor and ourdoor bars. 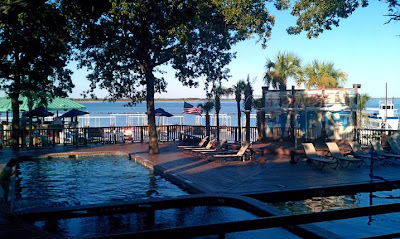 I want to be on that lake right now... Preferably with a drink in hand! Stunning! Makes me wanna go there! I hope that when you get preg for the first time, you have triplets so you have NO CHOICE but to be tied down and be a stay at home mom of THREE hahaha! I am going to pray for this at night. btw, I am LOVING your dark hair. seriously. what does hubs think? I wanted to email you this but I couldnt find your email address. I nominated you for a blog award! cali's in cali... such a jet setter she is!